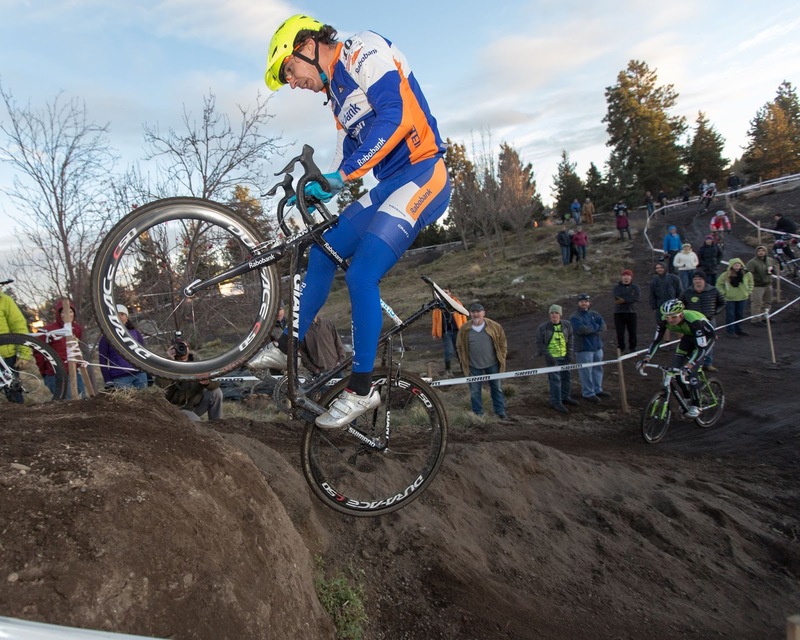 Bend Oregon is the final stop on the US Grand Prix of Cyclocross' four race tour. Yearly, this race draws both elite and amateur riders from a regional and global field. If the calibre of racing isn't enough, the beer garden surely justifies the trip south. The great American road trip takes 10+/- hours from the first ferry off Vancouver island to a draughty farmhouse outside of Bend. Brave a fitful first night and nervous stomach, wake up before dawn, and you'll be just about ready to race with the best the west has to offer. The USGP is hip enough to host a single speed race, and savvy enough to slot it in before the liquor stores open for the day. This means an 8:45 start time, and 40 minutes of breakfast making its way back up to your teeth. The ladies' Pro field lines up. Dropping in on a flatbar Time. We found donuts. We found puppies. We found every stout, bock, porter and seasonal ale offered by race sponsor Deschutes brewery. We found out what racing with a hangover feels like. A resounding success by any measure.